All remaining Philippine Airlines and PAL Express flights today (June 29, 2013) will operate according to schedule. 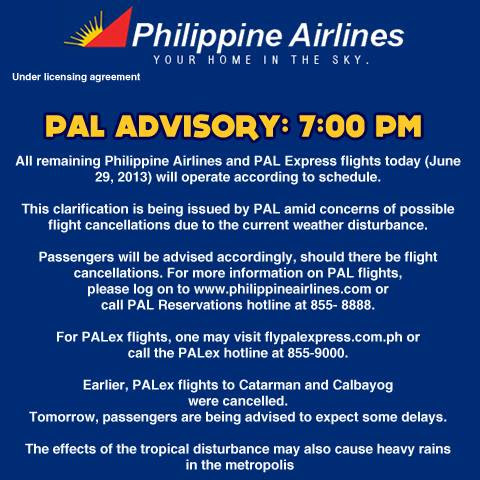 This clarification is being issued by PAL amid concerns of possible flight cancellations due to the current weather disturbance. Passengers will be advised accordingly, should there be flight cancellations. For more information on PAL flights, please log on to www.philippineairlines.com or call PAL Reservations hotline at 855- 8888. For PALex flights, one may visit flypalexpress.com.ph or call the PALex hotline at 855-9000. Earlier, PALex flights to Catarman and Calbayog were cancelled. Tomorrow, passengers are being advised to expect some delays.